Hong Konger's, that's what we go by.... my challenge was finding 13 images from the many thousands I have taken to best represent a cross section of Hong Kong society.. an impossible task so these are just the first 13, more will follow! Hong Kong streets are invariably crowded these days with the massive influx of mainland Chinese tourists, this is a rare sight.. Hong Konger's going about their daily business. One of my favourite places for people watching is the Sik Sik Yuen Wong Tai Sin Temple, quite simply this is a must visit place. An absolute classic image, people no longer talk to each other! This is a common sight these days, nobody talks to each other anymore, Hong Konger's simply cannot live without their smart phones / pads. The streets around the Ladies Market in Mongkok, Kowloon are also great for people watching.. these aging rockers were banging out classic 1960's hits in ENGLISH for the somewhat bemused but appreciative audience. The chap in this image looks like Mel Smith the famous English comedian.... he also doesn't appear to be happy posing for pre - wedding photographs in Stanley on the south side of Hong Kong Island, this couple at the time this picture was taken were NOT married, hopefully they are now!.... you can see the soon to be happy couples posing at the same 20 exotic locations spread over Hong Kong daily. The unsung heroes of Hong Kong, these chap's unclog our drains for the princely sum of HK$30 per hour, I do hope that every now and then they find a diamond ring / necklace! This one will stay long in the memory, I was with clients and we came across the gentleman in the grey sweater jigging in the street next to HSBC headquarters holding a large wad of HK$1,000 notes... it was either HK$250,000 or HK$500,000 and he let me hold them as well (for luck) .. he won the money at Happy Valley racetrack and had withdrawn his winnings and was off to Macau to gamble it all away. yahoo! Queuing for cookies, a Hong Kong thing. Somewhere in the infamous Chungking Mansions in TST, Kowloon is an outlet selling cookies, these cookies are famous (?) as every now and then a huge queue forms in the alleys around the building... how very, very odd. Scraping a living in their 80's... shocking. The old age allowance in Hong Kong is around HK$2,200 per month and is called fruit money, presumably a reference to the low amount, given the surplus that our Government generates every year they could easily double this amount... I always get slightly annoyed when I see very elderly people working 10 hours a day for a very meagre amount in order to supplement their "allowance"
Not much you can say really! Looking like an extra from "Brideshead Revisited" this lady was wailing, sorry, singing for a camera crew and looking somewhat out of place. There is nothing unusual about this chap and the way he is dressed, quite common actually but to me he looks like a complete plonker despite his impressive gym generated muscles. 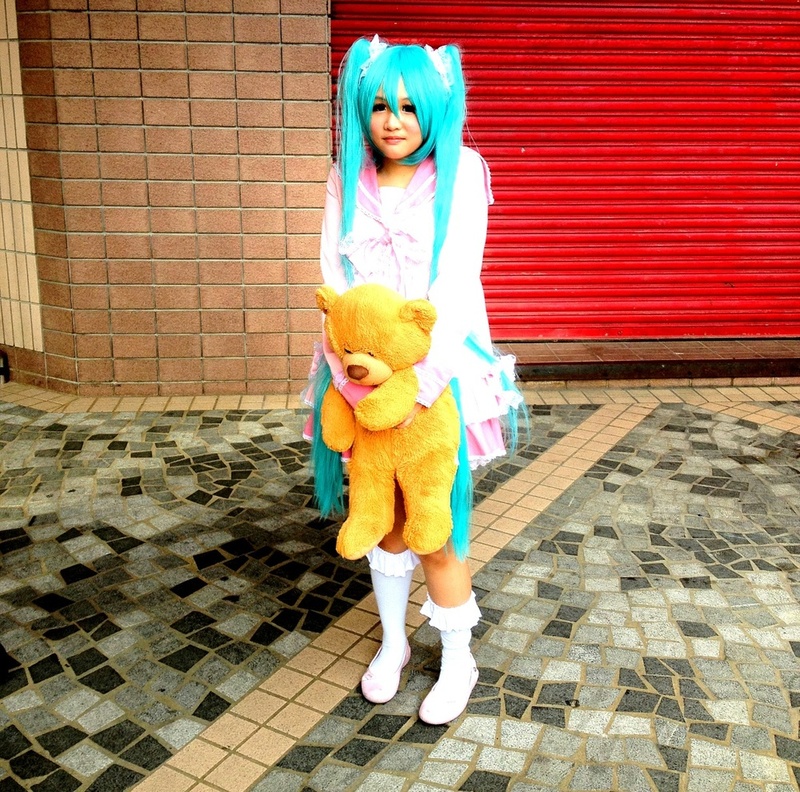 When I am out and about I often see young ladies dressed like Japanese cartoon characters, I have seen about 30 of them (all in Kowloon) and this is normal everyday wear for them. Posted on May 9, 2013 by Jamie Lloyd and filed under Iconic Hong Kong.